I went grocery shopping Thursday night and saved almost $77.00 between the coupons I used (almost $20) and the store savings. I was trying to spend $125.00 for groceries this week, and managed to walk out spending $105.32, which leaves me $20.00 when we run out of bread or need fresh fruit. My favorite deal was $1.88/gallon milk! It hasn't been that low in over a year, and I was able to buy 3 gallons at that price. We usually drink 2-3 gallons a week, so I bought 3! I would have spent more if they hadn't been out of Charmin. I am not especially brand-loyal, except for toilet tissue and diapers. The Charmin was almost 1/2 off, and the shelves were EMPTY! 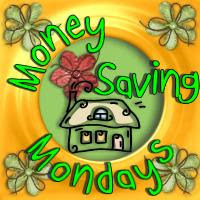 Which finally brings me to my money saving tip of the week -- Ask for rainchecks! When I was checking out, I asked the cashier for a raincheck on the Charmin. I had the store ad with me, so it was easy to point out the sale. She had someone check to make sure there really wasn't any more, then filled out a raincheck so that I can pick up 2 at that price anytime in the next 30 days. I tuck the raincheck in the front of my coupon pouch so I don't forget to use it. Do you have a grocery shopping tip to share? Leave me a comment! Also -- any interest in me creating a "Mr. Linky" for this topic so others can post about this topic on their blogs and leave a link? Let me know and I'd be happy to set it up!